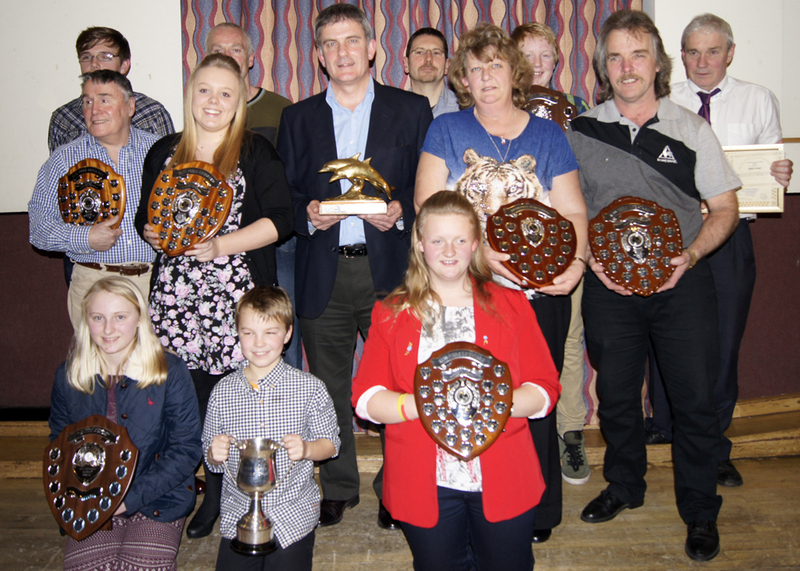 The Club has held its Annual Awards Evening and yet again had a fantastic turn out, great to see so many people and great fun was had by all. 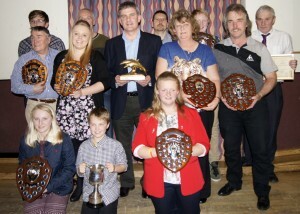 We are proud to announce the winners of our club awards – see below. If you scroll further down you will be able to see the citations that were read out for all of these very deserving recipients. A BIG WELL DONE! It becomes a more difficult task every year to select a candidate for the President’s award. If you reflect on the pre requisites IE the giving of oneself in the interests of others, there are in my opinion many candidates within our club who could be a worthy recipient. It takes a lot of individuals to come together to form a management team capable of advising, controlling, steering and formulating a very successful club such as ours. We are extremely fortunate to have those people who will give the expertise to achieve that success. Someone however has to bring the best out of that group and steer, stimulate, motivate and encourage the very best from all those individuals. We have in my sincere view been fortunate and privileged to have such a person. David Ayres has been our chairman for some considerable time and has displayed and applied superb qualities of leadership, dedication and enthusiasm we have all been able to follow. When you reflect back on life you will be aware that at times you come into contact with individuals who you could honestly say “he’s a natural leader, a man of principal, one that I can sincerely respect and follow”. David in my view is one of those people. I understand he is intending to stand down from his role as chairman at our next AGM. We all owe him a great debt of gratitude for his leadership, professionalism and dedication to our cause. Lara has shown such tremendous dedication to the aims and objectives of the club as a whole. Lara continues to work tirelessly for the benefit others. She is a very active and enthusiastic member of the club, committed to providing safety cover at many events either on our safety boats or paddling. She is committed to providing high quality and enjoyable training for our Rookie members and has gained her Assistant Instructor qualification and Rookie trainer qualification whilst continuing to train herself to gain her Survive and Save awards. Amy completed her Assistant instructor award in March 2012 and since then has been teaching a Rookie group every Thursday evening taking many new recruits through the early stages in lifesaving. She is always cheerful and I do not think I have ever seen her without a bright smile on her face. In addition she completed her kayak award. She has assisted on many events acting as safety cover paddling a paddle board. These events the club would not be able to do without the commitment of members like Amy. Both Lyndon and Tim are dedicated members of the club. Between them they have enhanced the later training session by embracing and providing training for the new survive and save program. They provided beach training which together has led to an increase in the numbers of senior members at the club. They both also take an active role in providing safety cover, working with and developing those that they train. Simon reluctantly took over the role of Club Captain and has worked tirelessly in pursuing his duties as Captain. He has sorted out the rota for Coxswain of Legacy for 2013 and has worked many hours himself to ensure that Legacy has been operational throughout the season. He is a dedicated and conscientious member of the club and always willing to help others. Spencer is one of our smallest members, there’s nothing he cannot do! He fought the current every month in the summer during beach training, showing amazing strength and determination. He continues to work hard in his pool sessions and has shown such promise that he will make a talented lifeguard in the future. Harrison’s attendance is excellent; always on time and he always gives his best. He is the first to admit he is not the best swimmer but always tries his hardest. In the past his attitude has not always been desirable but in this last year he has turned himself around and is now a conscientious and dedicated member of Poole Lifeguard Club . Well done Harrison, keep it up! Hannah has worked very hard since she joined the club and has continued to make excellent progress. She worked hard in all her beach training sessions and continues to put the same effort into her pool work. She has been the recipient of our Rookie of the month award for her hard work and dedication to training and more recently has put her name forward for competitions. She is an excellent Rookie who is well deserving of this award. Julie has supported both her husband and daughter on every event they have been involved with and she herself whilst having no formal training has assisted in many events for example the Brownsea Swim, the Seahorse swim and also many other events acting as shore patrol and shore safety cover. She is always willing to help at many functions and deputizes for the membership secretary during holiday periods. In 2013 the RLSS Poole Lifeguard Club took ownership of a new rescue boat, RLSS Poole Legacy. To achieve this Brian applied for a grant from the Talbot Village Trust to assist with the purchase of the new vessel. The Talbot Village Trust subsequently donated £17,600.00 to RLSS Poole Lifeguard Club to assist with the purchase of the new rescue boat Legacy. Brian liaised with Ribcraft on a regular basis to ensure Legacy was initially equipped to our requirements. After Legacy was delivered; a number of sea trials and coxswain familiarization training sessions were organised by Brian. Brian went on to organise the official naming ceremony of the boat. Dave joined the club initially as a ‘parent helper’; he has now become a dedicated member of the training team. He is always there week in, week out willing to take a group at a moment’s notice; Mr Dependable! Glen has been a member of RLSSPoole Lifeguard Club for a number of years. He has provided safety cover; as a paddler at a number of events. During 2013 Glen increased his involvement, in addition to assisting with safety cover as a paddler he also assisted with safety cover at the Royal Motor Yacht Club youth regatta, assisted in the set up for the Brownsea Island swim and became involved as a crew member on RLSS Poole Legacy.